Ford Farms started in the Brahman business in 1985 with purebred females from Rocking S Ranch. Top females have been added from S Bar Ranch Dispersal Sale, Nathan Candler, Samuel Duplantis, Moreno Ranches, Inc, and Matthew Pounds. Brahman bulls have been have been entered in the Florida Bull Test, University of Florida, for the first time with a son of JDH Mr Ruben Manso 549/1, winning the feed efficiency test and a son of JDH Mr Manso 236/3 passing the fertility test at 15 months of age. 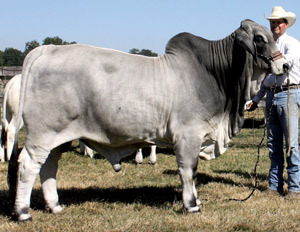 F-1 Brahman-Angus females are used for commercial cattleman for herd replacements. Our history is not as long as many in the Brahman business, but our quality has been our focus point since day 1 by using AI for some ten years and adding herd bulls that are proven and from top bloodlines. Ford Farms looks toward the future with much enthusiasm and producing high quality Brahman cattle to be used in commercial herds or purebred herds. © 2013 Ford Farms. Website Design by CR Publishing.